I’ve been a fan of R.L. Stedman’s since I read her debut YA novel, A Necklace of Souls, when it was first released. 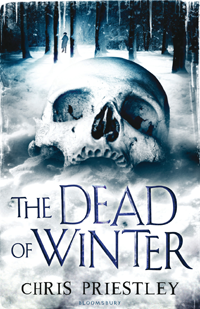 I absolutely loved her dark, gripping fantasy story and it reignited my love of fantasy. You can read my review of A Necklace of Souls from 2013 here on the blog. Since writing A Necklace of Souls, R.L. Stedman has gone on to write a sequel, called A Skillful Warrior, and a standalone YA novel, called Inner Fire. She has just released her new book, aimed at younger readers, called The Prankster and the Ghost and it’s a terrific read. Stuck in a hospital bed, unable to move, Tayla decides to leave his body. But floating around intensive care is kind of boring, although being invisible means he can do some cool practical jokes…Until the inspector arrives, that is. Jamie, newly arrived from Scotland, is lonely. No-one can understand his accent and all his practical jokes are going wrong. Plus, his new school is seriously weird. Perhaps it’s haunted. 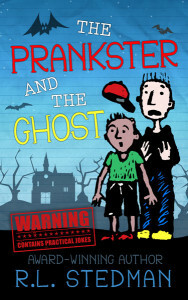 The Prankster and the Ghost is a fun, spooky story, packed with ghosts, practical jokes, and a whole lot of heart. It’s also a story about friendship and how good friends can help you through tough times, whether it’s moving countries to live on the other side of the world or grieving for a loved one. Young readers, especially boys are going to lap up this story, with all the pranks that Tayla and Jamie like to play. The story starts off with a bang (literally) when the car that Tayla’s dad is driving crashes and Tayla wakes up in hospital to find himself floating over his body. As Tayla is coming to terms with the events of the crash a strange woman called Mrs Myrtle Mannering (or the Inspector) turns up at the hospital looking for him. She is an inspector from the Bureau of Unexplained and Malicious Phenomena, or BUMP, and she tells Tayla that he is stuck between his body and death. Mrs Mannering explains that the best thing for Tayla to do until his mum gets better and his body heals is to go to a special school, a school of ghosts. This is where he meets Jamie, a boy from Scotland, who has just moved to New Zealand with his parents and two annoying sisters. Jamie loves pranks just as much as Tayla and luckily he can see ghosts (or boys who are in between life and death). 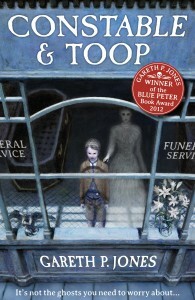 With the help of Jamie and some ghostly children Tayla tries to get his old life back. 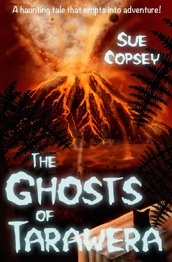 I especially loved the ghostly elements of the story. I really like the idea of BUMP and I could imagine Jamie growing up to have a job in BUMP, helping other ghosts just like Tayla. The idea of a school for ghosts is really cool too. There are ghost children from different periods of time and an old fashioned ghost teacher who becomes obsessed with modern technology. One of the cool added extras in this book is the list of jokes from the story that R.L. Stedman has put in the back of the book. There are jokes involving cling film and a toilet, itching powder and stink bombs. She challenges readers to find all the jokes that happen in the book, but suggests that if you do try them you might want to tell an adult first. Grab a copy of The Prankster and the Ghost in paperback or eBook now. Check out Rachel Stedman’s website for details about where to buy the book. 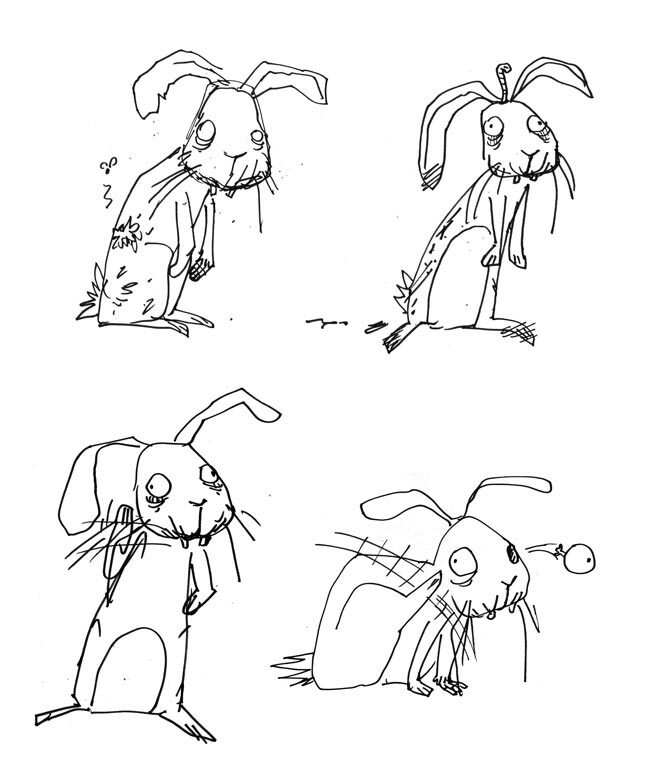 I have never owned a rabbit, let alone a zombified one, so when I began working on ‘My Dead Bunny’ I had no idea how to approach the character of Bunny Brad. I knew plenty about zombies, having watched all of the Walking Dead and the original Romero film Night of The Living Dead; but I didn’t know how to draw a decent rabbit (or, as this book required, an indecent one). In addition, I wasn’t sure what illustration style would suit the book; in the first few pages I needed to show a live rabbit being electrocuted, then coming back as a zombie, and I needed to accomplish this without making the audience want to stop reading, close the book, and burn it immediately. As you would expect, it was a challenge bringing a dead bunny to life. I always start a book by developing the main character. This inevitably involves experimenting with style at the same time. Once the main character design has settled, it informs the style of the whole book; everything else forms around it. I wrote these three questions down in my sketchbook, and tried a few drawings. The brain worm was there from the start, as was the idea to have Bunny Brad appear at the narrator’s bedroom door casting a long shadow. But that’s about all in these sketches that looks familiar. At this point I realised I needed to look at reference photos of actual rabbits, so that I could clarify what features I needed to include. I soon found another challenge; how could I take a rabbit’s features and zombify them? Rabbits look very alert, anxious and cuddly, whereas zombies need to look slow, dim-witted and creepy. How could I draw a zombified rabbit and still have it seem like a rabbit? I tried many many options over many many months. Here are some of those designs. The publishers (god bless them) were very patient and supportive, rejecting options that were too cute and/or not strong enough. 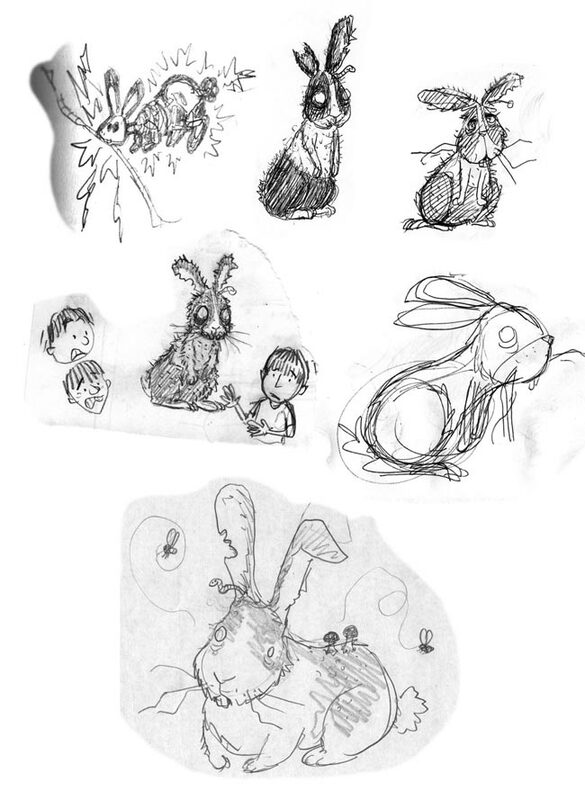 After many rejected character designs I was feeling very frustrated, so I sat on my studio floor with a big sheet of paper and a sharpie, and drew some ridiculous zombie rabbits that I thought the publisher would hate. ‘Let’s see what they think of these!’ I thought. I sent the sketches off with a devilish glint in my eye. I felt surprised, then relieved. The character had finally clicked, and so had the style. 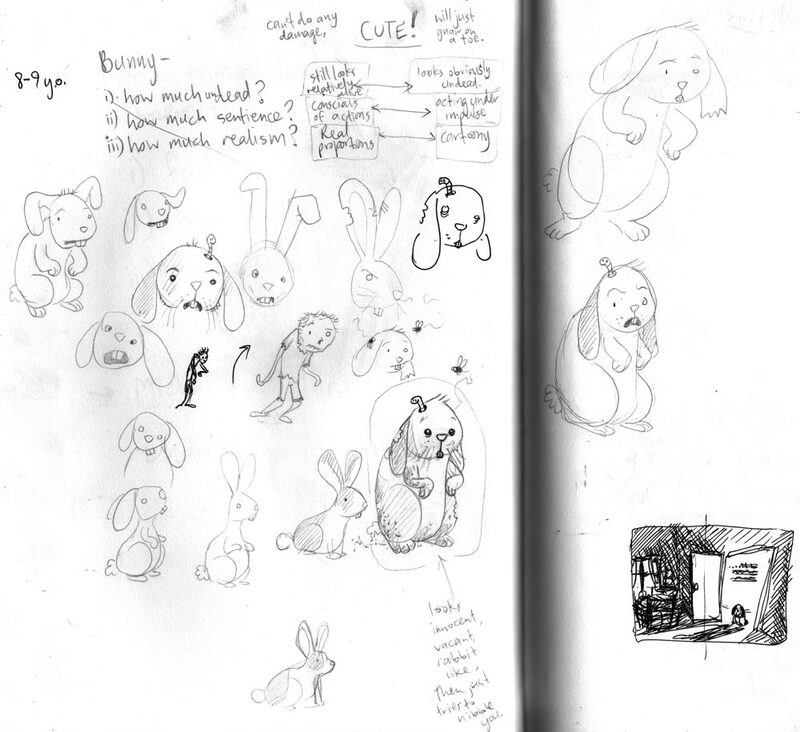 Bunny Brad shifted a bit from that sketch to the final version, but he was basically there, and the rest of the book flowed quite easily once he was in place. It’s always the case that I spend at least half of the creative process experimenting and planning. Quite often there’s a point where it seems like it’s never going to work – that the character is never going to settle and the book won’t go anywhere. I’m so glad Bunny Brad eventually turned up! He’s been a heap of fun to work with (if a bit nibbly). 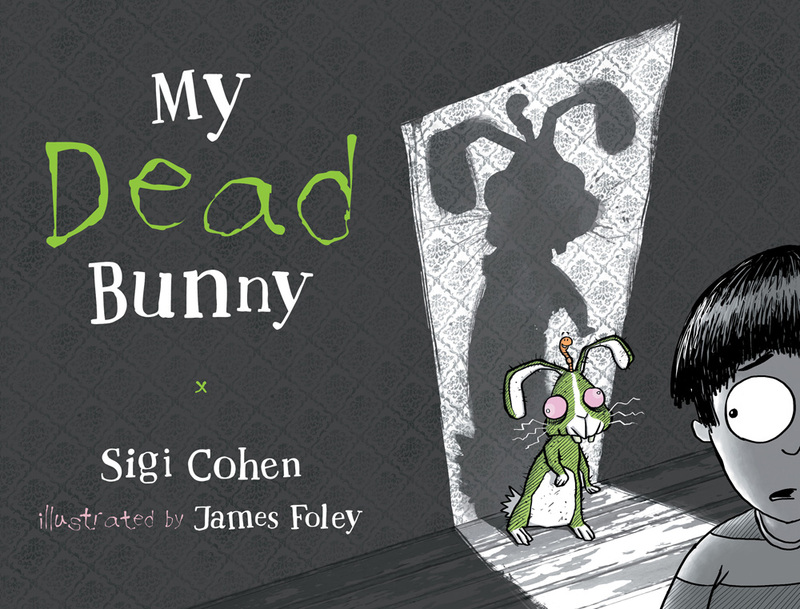 My Dead Bunny by Sigi Cohen and James Foley is available now from Walker Books Australia. Grab a copy now from your library or bookshop. We first meet Brad when he is visiting his owner in bed one night and we’re told of how Brad came to be dead. Brad was just a normal, cute, fluffy bunny until the day he decided to chew through the TV cord and got electrocuted. The family bury him but the boy misses him and decides to dig him up and check on him. This is when Brad starts to cause a panic, scaring everyone silly, stinking up the house and making a mess. The situation gets so bad that the boy and his friends have to come up with a plan to deal with dead Bunny Brad. Will their plan just cause more problems instead? I absolutely love this picture book! It is creepy, disgusting and absolutely hilarious. It’s completely the opposite of those cutesy picture books about bunny rabbits and it will appeal hugely to boys. You would have to make sure you knew your audience when reading it aloud, as you wouldn’t want to traumatise a kid whose beloved pet had just died. Sigi Cohen and James Foley are a dream team for this book. Sigi Cohen’s rollicking rhyming text will have you laughing out loud as you read it. I love his descriptions of zombie Bunny Brad, which are creepy and funny at the same time. James Foley’s illustrations are delightfully creepy but hilarious. James has used a very simple colour palette, mostly black and grey, with green and orange to add effect. The green of zombie Brad really makes him stand out, compared to his living self which is grey. James really makes zombie Brad look creepy and disgusting, with his pink, runny eyes, his horrible teeth, and the worm sticking out of his head. 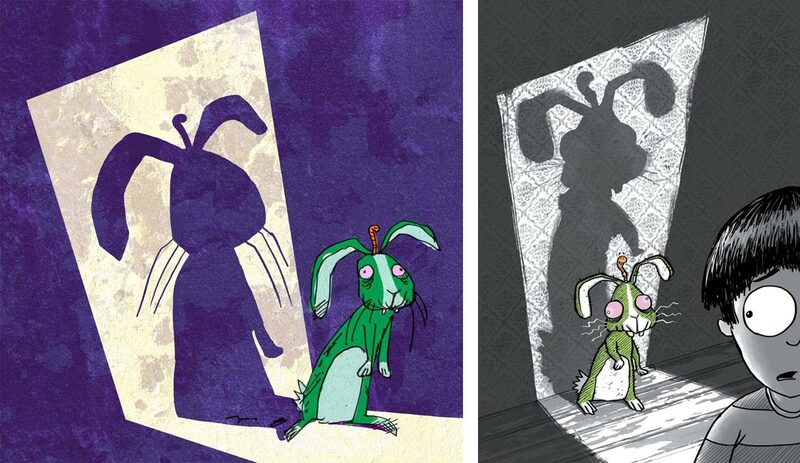 James also uses different angles and shadows to add to the creepiness of the illustrations. I even love James’ end papers of the book, which show Brad before and after his accident. My Dead Bunny is a perfect picture book for older readers and younger readers who like a bit of a scare and a good laugh. As part of my Seriously Spooky Month I asked some of my favourite spooky authors to write a guest post for My Best Friends Are Books. Today I’m joined by Lesley Gibbes, author of the award-winning book, Scary Night. Lesley joins me on My Best Friends Are Books today to talk about her spooky picture book. There’s no denying, I love all things scary! When I was a child I loved a good scare and nothing was scarier than the darkness of night. There’s something so deliciously terrifying about noises in the dark made by things you can’t see. My imagination would run wild and I loved it! So of course, my first picture book just had to be set in the dead of the night when anything can happen. And in SCARY NIGHT when three friends, Hare with a hat, Cat with a cake and Pig with a parcel set out on a mysterious night-time journey all sorts of scary things happen. Close your eyes and imagine snapping crocodiles, roaring bears, mountain cliff tops, graveyards, bats, spiders, castle ruins and rats. Are you brave enough to join the journey and find out just where the three friends are going? Go on, you won’t believe the surprise! SCARY NIGHT has just the right amount of scare to give your kids a thrill with a reassuring ending that’s sure to have everyone celebrating. It was awarded Honour Book, by the Children’s Book Council of Australia for Early Childhood Book of the Year 2015 and is the perfect book for Halloween this October! Beware – Seriously Spooky Month is here! I love spooky books for kids and teens! If it’s got ghosts, witches, vampires (non-sparkly ones), zombies or anything supernatural I’ll read it. So I’ve decided to dedicate a whole month to spooky stories. Throughout Seriously Spooky Month in October I’m highlighting my favourite spooky and scary books for kids of all ages, from picture books right through to YA. I’m also very excited to have some wonderful guest posts from authors and illustrators who create spooky books for kids, including Barry Hutchison, Chris Priestly, Gareth P. Jones, R.L. Stedman, Sue Copsey and James Foley. Scare your socks off this October and join me for some Seriously Spooky reads! 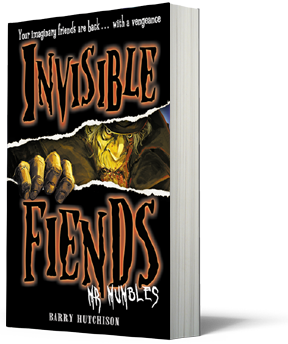 If you know a young reader who likes adventure stories that are a bit spooky and really funny, then I’ve got a new series for you! Undead Pets by Sam Hay is an awesome new series for 7+ featuring zombie animals and ‘pets with one last thing to do before they pass to the other side.’ As well as a great story (that boys especially will love) the books are illustrated throughout by Simon Cooper. I especially like the cartoons that describe how each of the pets die. I reckon the covers are terrific and are sure to jump off the shelves. Young readers will get hooked on Undead Pets and they’ll gobble them up in no time. They’re stand alone adventures so kids can start with any of the books. Read all about the different books in the series below and watch the cool book trailer. Joe is off on a school trip to an adventure camp, and he can’t wait to put Uncle Charlie’s survival tips into practice! But it’s not long before he’s visited by Dexter, a scruffy-looking dog, with a howling tale of woe. Dexter doesn’t want his owner feeling guilty for his death, but it’ll be hard for Joe to intervene this time – it turns out that the owner is Joe’s headmaster, the dreaded Mr Hill! Just when Joe thought things couldn’t get any stranger, he is visited by Fizz, a zombie goldfish. Fizz was flushed down the toilet by his owner Danny’s little sister, who doesn’t realize that she’s sent the fish to a watery grave. Fizz needs to ensure the truth is revealed before his fellow fish meet a similar fate. But how do you get a goldfish to rest in peace? Fluffy’s owner, Olivia, lost a necklace in her back garden and she’s going to get in big trouble if it isn’t found. Fluffy can’t bear to see her owner in distress and she demands that Joe finds the necklace – now! Can Joe do what Fluffy wants or will the undead pet be hopping around forever? Some of my favourite stories are ones that creep me out and send a chill down my spine. When I was a kid there weren’t many authors who wrote horror stories or ghost stories. R.L. Stine’s books were about the creepiest I could find and he’s still writing them today. I also have to add Michelle Harrison, even though she writes all sorts of books. Her recent book, Unrest is one of the creepiest books for kids or teens that I’ve ever read and I highly recommend it! Who are your favourite spooky authors or spooky books?